Time to restart the Go-To List! Looking ahead to when I am all settled back into my studio routine this summer, I would like to restart my Go-To List on glazing-only china horse commissions. This was working well for me before I left for the UK. It is a very simple and informal system. 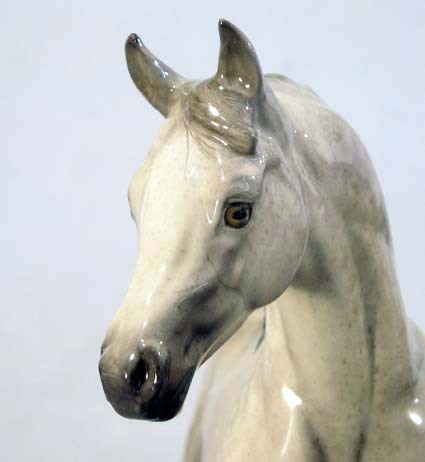 You email me that you are interested in my glazing work on X china horse, to your color choice. When I have a bisque of that particular horse ready to go I contact the next person on the list who wants one of those, quote a price and a (fairly short) timeline for completion. This works really well for me because I only start a piece when I am ready. There’s no big backlog pressure, it’s just my “go-to” list of those interested in a commission. And there’s no commitment on your part either. If I have a slot open and you’re next, you can just decline if you’re not ready or no longer interested. 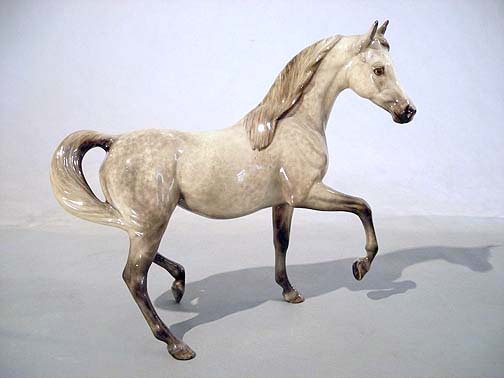 From my own china sculpture “back catalog”, you can ask for Heart of Darkness Oldenburg (large or small), Boreas or Halfling Boreas Percheron, Optime Arabian, Streetwise Quarter Horse, and possibly a Caprice Holsteiner (but that mold is about gone). I will making all castings in earthenware china, but I may also have a few bone chinas from my archives to offer. Since Alchemy in England no longer has my molds, there won’t be any more bone chinas made of my older work. I’m still thinking about whether to have new sculptures made in England for bone china. Commissions on the Go-To List also will include glazing your bisque china horse sculpted by someone else. So if you’ve got a bisque looking for clothes, you can get it in my queue. Please let me know what you have first. I don’t glaze just anything… and I especially can’t glaze one-of-a-kind bisques or anything not easily replaceable if something goes wrong in the kiln. I charge anywhere from $500 to $2000+ for my work (lower of course if the bisque is one you send me)… it all depends on the complexity of the color. • Your color choice. Must be specific. I work my Go-To list based on what color I feel like glazing, in addition to what horse becomes available! I am totally looking forward to a summer of getting reacquainted with Fido The Kiln!